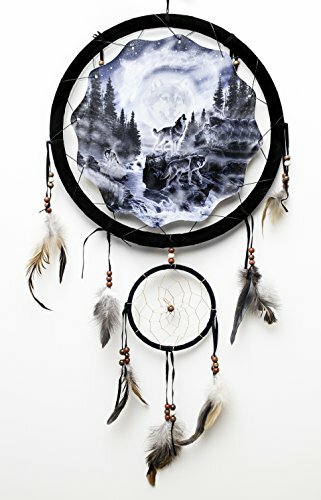 This Wolf Dream Catcher features several hidden wolves throughout the print and a wolf howling under the moon lit sky. The large dream catcher measures 13" diameter while the smaller dream catcher measures 5" diameter. Total length measures approximately 33". Includes a cord so it can be hung on a wall. 7 feathers and multiple color beads. The printed image measures approximately 11" across. Image is printed on one side only. Total length measures approximately 33"
If you have any questions about this product by Vena Beauty, contact us by completing and submitting the form below. If you are looking for a specif part number, please include it with your message.